This recipe was in my cookbook Amy’s Favorite Recipes published back in 2010 and I have adapted it for the Instant Pot. The original recipe came from my mother’s Army wives group when they were stationed in Texas. It’s perfect on a winter day and freezes very well. I often serve it with my 2 Smart Point Slider Buns. 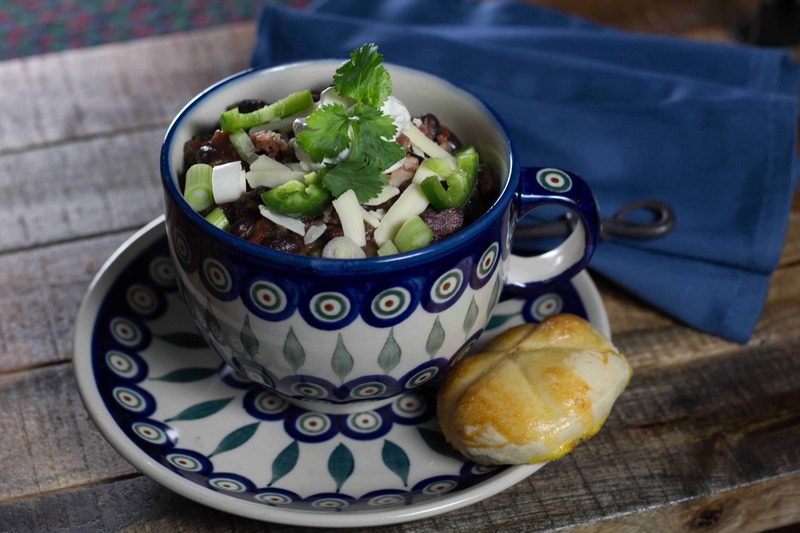 Delicious Caribbean Black Bean hot soup on a winter’s day in no time! No need to pre-soak the beans when you’re using the Instant Pot. This is a family favorite! Be sure and let your family and guests personalize their own bowl with their favorite toppings. (Slider bun pictured with the soup.) Eat some for dinner tonight and freeze the rest for another time! When hot, add the bacon. Cook until crisp, then remove. To the drippings in the pot, add onions, garlic, red/green pepper and celery. Saute until soft. Turn off Instant Pot. Add tomatoes, spices, black beans, chicken broth, and ham. When finished allow to naturally release for at least 20 min. Then turn valve to venting. Taste beans and make sure they are done (soft not hard). If not done to your liking, set vent to sealing again, then push, “Manual,” and decrease time to 5 minutes. Stir in sherry, vinegar, pimentos, green chilies, Tabasco or Sriracha to taste, salt and pepper. Turn on Instant Pot to, “Saute,” and cook another 10 minutes. Add crumbled bacon and optional toppings if desired. Garnish with a bit of cilantro. We usually eat this for dinner the first night, then I freeze the rest in 1 c. portions in freezer sealed bags. I find it’s easier to store the bags in my freezer than plastic containers. 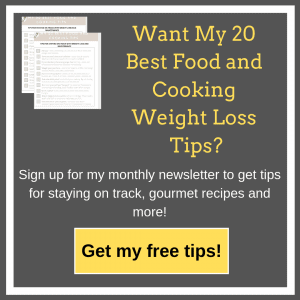 When I’m ready, I just thaw a bit in microwave and then pour into my bowl and reheat until hot. 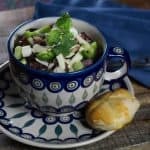 No Replies to "Caribbean Black Bean Soup-Instant Pot"